Play as alien hunter Eisenhorn, and hunt down an ancient tome of evil using your powers, gadgets and skills. 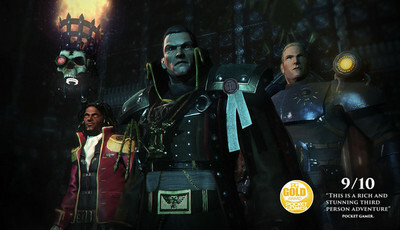 Eisenhorn: XENOS is a visually-rich third person action adventure, with a Warhammer 40K universe setting, taking players to a dark grim future similar to that of Arkham Asylum. Based on the Eisenhorn trilogy books by Dan Abnett, Xenos for Android brings the story to life. In the game, you will assume the role of Gregor Eisenhor, an inquisitor of the Ordo Xenos, which are alien hunters of the Imperium. You must make use of your character's stealth skills, psychic powers and advanced weapons to complete your quests, root out the worst heretics and ultimately destroy the Tome. You can free download the full apk of Eisenhorn: XENOS from the links available below and enjoy the paid game without spending the money. However, as this is only for testing purposes, you will have to eventually buy it from the Play Store if you like it! There is no mod to unlock weapons and stuff, but we may provide it in the future. Install apk file, Extract additional DATA to sd card Android/Obb , and play. NOTE: You will need a pretty powerful device to run the game as it probably won't work on old low-end phones.